For a second year in a row, WCA Hospital is spearheading a local effort to raise awareness of breast cancer in conjunction with National Breast Cancer Awareness Month in October. 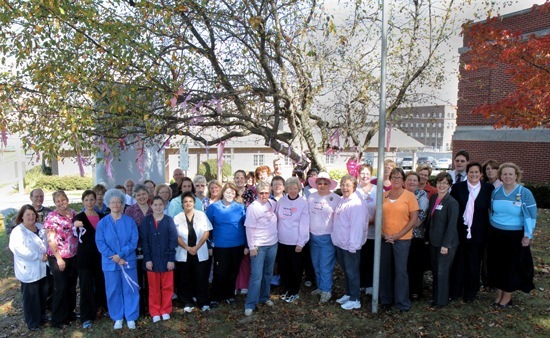 The WCA Family and community members participated in a, “Pink Ribbon Tree Hanging Ceremony” by tying their own personalized pink ribbon—signed by the person they were paying tribute to—in honor or memory of someone diagnosed with breast cancer around the tree on the front lawn of WCA Hospital at 207 Foote Avenue. “When I drive past that tree, it warms my heart,” Linda Jonson said. Linda pointed at the “Pink Ribbon Tree” on the corner of Foote Avenue and Allen Street in front of WCA Hospital. The tree is again adorned in pink ribbons and sparkling pink lights this year. WCA’s Pink Ribbon Tree, in year-2 of a tradition now planned for yearly renewal, honors people whose lives have been touched by breast cancer. Ribbons can be hung on the tree all through October by patients, friends, neighbors, care givers, cancer survivors and loved ones. Many of the ribbons proudly display a patient’s name, lovingly inscribed by someone who cares. This year, more than 220,000 women are expected to be diagnosed with breast cancer in the United States, according to the American Cancer Society. But breast cancer is not only a women’s issue; at least 1 in every 100 breast cancers diagnosed this year will be for a man, DeAngelo warned. “Breast Cancer Awareness is for everyone, and so is our Tree,” she promised. The success rates for overcoming breast cancer are also significant for many cases not rated as “early detection.” Many women diagnosed this year will probably have better success than current statistics suggest. It will be five years from now before the 5-year survival rates for today’s care are known. Improvements in treatment continue to produce more favorable outlooks for people being diagnosed with breast cancer today. “Breast cancer care is not always easy,” Johnson said, “but there are wonderful ways to make it more bearable. “When I was first diagnosed, I told my granddaughter, “I can’t pick you up and swing you around the way we used to do, at lest for a while.” But children have a magical way of making everything OK. She put her hand over my heart and said, ‘I’ll give you Brave Power’.” Whatever the medical or surgical treatment, drawing on the love of friends and family themselves is one of the best “self-medications” a cancer patient can get. Even there, WCA can help. WCA Hospital has created the Patient Navigation System, a program to help patients, family and friends in navigating the sometimes complicated, confusing, and intimidating sea of details that can go with becoming a cancer survivor, according to DeAngelo. A Patient Navigator is a specially trained companion who joins with a patient, knows where to go, what to expect at the next turn, and especially the language and people in the new world of care the patient is entering. The navigator can even go to doctor’s appointments with the patient and help family and friends plan for a ride or a meal or just a hand to hold. Patient navigators now work with patients with many kinds of cancers and for many other kinds of care at WCA. “My husband, Dan, still wears his white bracelet,” Linda said proudly. “And he attended every therapy session with me too.” In this way, whether it was a Patient Navigator, Johnson’s friends or her family, they demonstrated the “breast cancer buddy” model of support now thought of as the ideal of care, no matter a patient lives or what kind of cancer a patient is overcoming. “A lot of modern cancer care calls on the patient in her or his own therapy,” DeAngelo said. “It’s often in lifestyle choices.” According to a 2002 Cornell University report, “One extensive study examined diet after diagnosis and survival of women enrolled in the Nurses Health Study. In this study, the 1,982 women who developed breast cancer were followed for an average of 13 years…Women who ate more fiber, fish, and vegetables also had a lower risk of death than women who ate less of these food and nutrients.” Some foods or nutrients were associated with as much as a 50% increase in the probability of survival for some cancers. American Cancer Society, at www.cancer.org, and the WCA Patient Navigation team, also advise quitting all alcoholic beverages and not smoking as the most basic of all self-care tips. Many cancer survivors say their treatment came with the discovery of personal gifts and strengths they never knew they had. “I discovered that I loved being bald!” Linda Johnson said with a delighted smile. “Just think, no hair driers, no setting, no pinning and no brushing.” Her hair, however, has now all grown back, for which she is also quite pleased. “Some women love wigs,” DeAngelo added. “They can be a real morale booster, a touch of style and a great reminder of the glowing health they’re coming back to. “Wig or bald, each is a perfect choice, if it sits you best,” she added. The Pink Ribbon Tree stands at the corner of Foote Avenue and Allen Street in front of WCA Hospital for all to see, as an invitation to “tie one on,” add a pink ribbon for yourself or someone you know and, most of all, as a reminder for an annual mammogram. The tree is a reminder for men too; a reminder to care about women friends, neighbors, co-workers and loved ones who may be fighting a difficult battle of their own. Friendship is both ammunition and very good medicine. The ribbon tree is a reminder for men, too, to know their own bodies. Remember, 1 in 100 breast cancers will be diagnosed in a man this year.